It's the last thing mice see around here. Dirty Girl's tiara fashioned by Ferdinand. Dirty Girl's been doing a bang-up job keeping the shop mouse-free all winter. 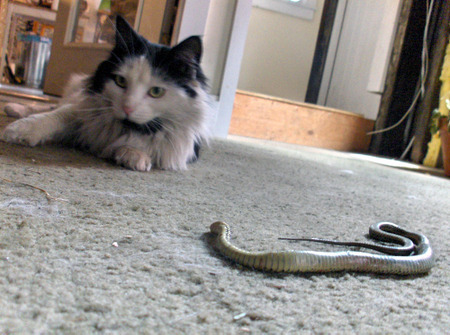 Now with the onset of warmer weather, she's turned her attention to ridding the alley of snakes. 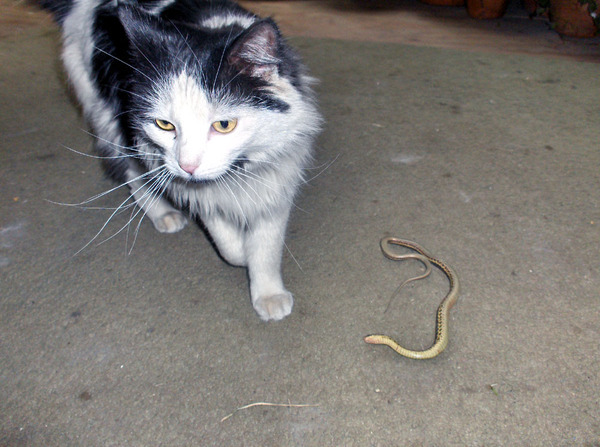 Today she brought this unfortunate Garter snake upstairs and staged several dramatic re-enactments of the hunt outside the shop door for me and Rich. Then she spent some time lying beside it, looking nonchalant. I feel really bad for the snake, but I know this is how the Girl's wired, and it's what she was doing when I first met her. And she's really, really good at it. it's been a little dull the last couple days. This is the shop mouser, Dirty Girl. She's doing a good job keeping the place free of vermin, but I think she's bored stiff. She's been drinking out of the glue water. The cat's got a lot of hair.